Sunny Wilkinson has taught privately and in universities around the country for over 40 years. Always looking to expand her palate of teaching tools, she has most recently been inspired by the study of Alexander Technique, Feldenkrais, and NIA as a means to help students open and center their voices. She developed the vocal jazz program at Michigan State University and has also taught at Fullerton College, Cal State Northridge, Western Michigan University, Hillsdale College and the University of Michigan. Sunny has conducted hundreds of master classes at jazz programs across the country. 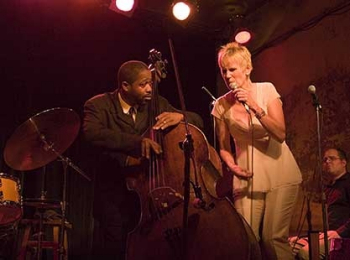 Many of her former students are now the heads of vocal jazz programs at universities and have successful careers as performers and recording artists. Singing is supposed to be fun. Developing and strengthening your instrument should be fun as well. I encourage movement and vocalizations to find the core of each student’s sound, free the registers, and extend and strengthen range. Of course, I help refine musicianship, intonation, phrasing, and a personal connection to the lyric. But even more, I am a freer of sound, and a conduit to help students explore their potential. This is often done in the spirit of play. In the end my mantra is less effort, more awareness. Sunny is available for private instruction in person or through Skype. Contact Sunny for more information.